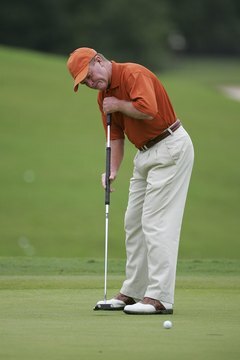 Learning how to use a long putter may improve your golf scores. Long putters eliminate extra hand and wrist movement to make it easier to roll the ball straight. The shaft of the club is extended between 8 to 12 inches longer than a standard putter. When the golfer bends over the club, his chest presses against the end of the shaft to create a pivot point, keeping the club on a straight line on both the backswing and the follow-through. Walk to the hole from your ball to determine the length and direction of the putt. Stop at the halfway point to judge the distance. Place your feet shoulder-width apart and bend your knees slightly. Line up the ball so it lies near the middle of your stance. Balance your weight between both feet and center your eyes over the ball. Wrap your dominant hand around the bottom of the club's grip with the palm facing the hole. Lean over the club until your sternum sits on top of the grip end of the shaft. Grip the top of the club with your non-dominant hand and bend the arm to form a 90-degree angle at the elbow. Aim your elbow toward the hole to help line up the shot. Find a point several inches in front of the ball that is in line with the line you've determined for the putt. Align the putter face to aim toward that point. Pull the club back in a straight line and swing it forward along the same line to strike the ball. Drive the putter through the ball so your follow-through and backswing are the same length. Increase the length of your backswing and follow-through to hit the ball harder on long putts.